On April 11, 2017, the anti-slavery justice movement made a resounding, unified statement to the U.S. Congress: “College Students Want to See an End to Slavery in Their Lifetime.” This day was IJM’s #RallyForFreedom. Over 50 college campuses across 23 different states gathered thousands of college student signatures in support of the End Modern Slavery Initiative (EMSI) petition. This petition asks Congress to fund the EMSI, so that more people in more places than ever before can be rescued from slavery. This great moment in the justice movement was only made possible because of the relentless leadership of our IJM Campus Chapter teams. These student leaders sacrificed long hours over multiple weeks to plan for their individual Rallies. 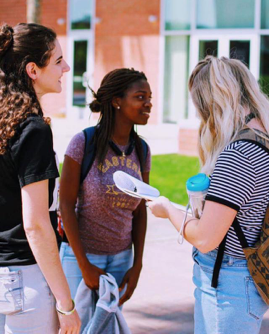 Then, after all of the planning, these leaders stood for multiple hours on their campus engaging students in conversation to educate them on the issue of modern slavery and asking them to sign the petition. We wanted to highlight some of the individual campus chapters as an encouragement to all of us in the justice movement—and to those who have yet to join. These leaders showed true dedication, energy and creativity. As we read these stories, let us be challenged to follow the example these students have set as we pursue justice in our own spheres of influence! Many thanks from all of us at IJM to those of you who participated in #RallyForFreedom. 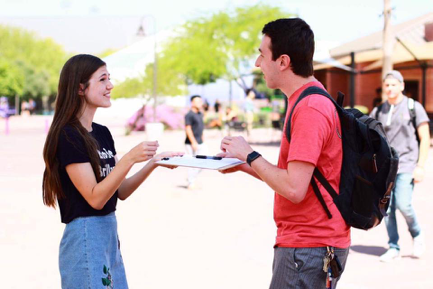 After seven months of navigating many hurdles to become an officially recognized IJM Campus Chapter at their university, GCU finally became an official chapter at the beginning of April. With only a few weeks to plan, they hosted a #RallyForFreedom as their first event. In their first event on campus—and despite having a shortened time frame to plan—these leaders collected 840 signatures. What an amazing start to leading the fight to end slavery on their campus! 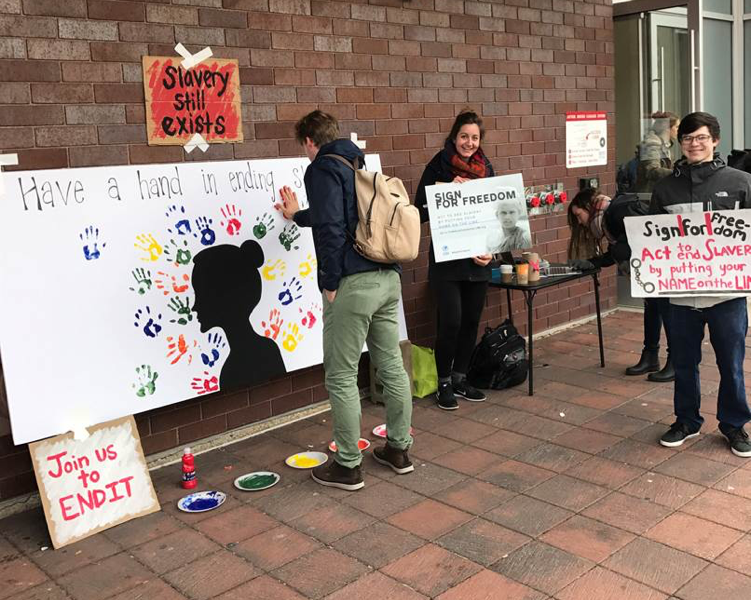 The UD leaders not only held a #RallyForFreedom in which they gathered many signatures, but also engaged their students in another creative way. They had a large wooden 'X' for students to sign and respond to the question, "Why should all be free?" This prompted students to think about the issue of slavery more deeply and hopefully encouraged them to get more involved in the future. Lexie was unable to get a booth on her campus for the #RallyForFreedom. Instead of giving up, Lexie decided to host a one-woman mobile Rally. She spent the day walking around, covering her campus and asking people for signatures, all while wearing her fair trade t-shirt (which, in some cases, turned out to be a good conversation starter). In return for Lexie’s boldness and perseverance, she was able to gather 102 signatures! What an awesome example of someone rising to the challenge and making the best out of a situation. Both schools braved the rain and cold all day during their respective Rallies. Despite the bad weather, leaders from both campuses managed to gather hundreds of signatures. We love the passion these students showed for the cause of ending slavery. IJM Campus Chapters Rally Across the U.S.